Sony Xperia Touch hands-on hands on review | What Hi-Fi? We first clapped eyes on the then-unnamed Xperia Touch at MWC 2016, but it’s taken Sony Mobile until MWC 2017 to move the petite projector officially from prototype to reality. The dinky short-throw device packs some clever technology into its compact dimensions, which sees it able to turn any flat surface into a 23in touchscreen. Are we the only ones thinking that Minority Report technology is here? We didn’t think so. Read on to see if it can live up to our sci-fi dreams. To give you an idea of just how compact the Xperia Touch stands is, it stands less than 15cm tall and 7cm wide, making it smaller than a lot of portable wireless speakers. There’s a high gloss finish on the front, with a metallic grille that wraps around its body, hiding a two-way stereo speaker setup for built-in sound. We got to have a quick listen to it with some video, and it certainly sounded loud and clear enough to listen to short clips and YouTube – whether it would suffice for a full movie on-the-go would be something to test in our full review. Also under those grilles is the projector itself. We weren’t given lots of information on its spec, apart from that it’s Sony’s “unique SXRD three primary colours LCD shutter system”, so we’re not sure what resolution this is firing at. We’d suspect 720p rather than Full HD, but we’ll update this when we get confirmation. Alongside the projector, the Xperia Touch also packs a 13MP camera with infrared sensor, which allows the projector to track motion and gestures for the touchscreen feel. Touchscreen control is possible only on projections up to 23in in size, though the picture can go up to 80in - for watching movies for example. Sony says it’s working on a companion smartphone app for these situations, which will be a welcome addition. As well as its convenient form factor, it also packs a built-in battery, giving you unplugged projection at full brightness for up to an hour – not enough for a full movie then, but still handy to move it around at your leisure. Automatic calibration is on board too, so this is about as plug and play as a projector can get. Switch it on and the Xperia Touch bursts into life pretty quickly, projecting an image either down on to a table or up on to a wall depending on its orientation. It runs on Android, so you’ll see a familiar Android homescreen once it’s loaded, with the ability to go into the Play Store to download all your favourite apps and games. This includes the likes of Netflix and Skype (you can use the built-in camera for video calls), as well as Cut the Rope and Fruit Ninja. We played the latter and found no issues whatsoever with lag - our touch was registered without delay. We were presented with lots of ideas on how the projector could be used, which really highlighted its versatility. Movie watching, video calls, game playing with family, internet browsing, recipe watching in the kitchen – the larger display makes it a much more social device than having your head stuck over your 10in tablet. In ambient light it’s bright enough to get by, but you’ll get best results when the room is a little darker – particularly for when watching movies. It’s hard not to be impressed by the Xperia Touch. Not just because it makes us feel like Tom Cruise (Minority Report Tom Cruise, not jumping-on-the-sofa-on-Oprah Tom Cruise), but also because it packs a lot of impressive tech into a really small and convenient form factor. What’s not so great is the price. At €1500, with a UK price TBC, it’s probably something only spend-happy early adopters might consider at first. That's fine for now, but it will need to become more accessible for it to really make the impact it deserves. 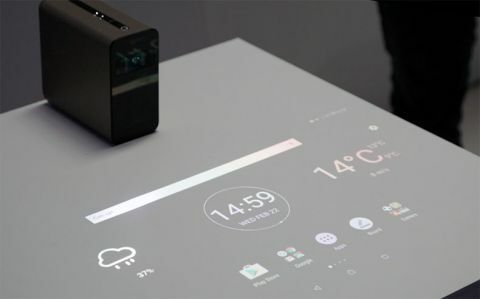 Part-tablet, part-projector, part-sci-fi dream, the Xperia Touch could well be a sign of things to come in this part of the industry.